He has published more than seventy articles in research publications including Cancer Research, Journal of Immunotherapy, Gene Therapy, Stem Cell and received three patents with several more pending. Dr. Wei developed a novel gene delivery system using embryonic yolk sac cells and his Dendritioma Technology has been licensed by three biotech companies. 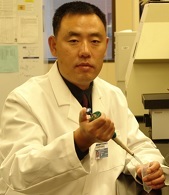 Dr. Wei also served as an Assistant Director of Clemson University Biomedical Institute (formally Oncology Research Institute at Greenville Health System) for fourteen years. Professor Wei received his BS from Shenyang Normal University, MS from the Institute of Hydrobiology, Chinese academy of Sciences, and Ph.D. from Ohio University. 4. Zhu L, Zhao Z, Wei Y, Marcotte W Jr, Wagner TE, Yu X. An IL-12/Shh-C domain fusion protein-based IL-12 autocrine loop for sustained natural killer cell activation. Int J Oncol. 2012 Aug;41(2):661-9. doi: 10.3892/ijo.2012.1466. 5. Zhao Z, Holle L, Song W, Wei Y, Wagner TE, Yu X. Antitumor and anti-angiogenic activities of Scutellaria barbata extracts in vitro are partially mediated by inhibition of Akt/protein kinase B. Mol Med Report. 2012 Mar;5(3):788-92. 6. Kim JY, Ballato J, Foy P, Hawkins T, Wei Y, Li J, Kim SO. Apoptosis experiments of cultured tumor cells treated with 200-μm-sized flexible microplasma jet. IEEE Transactions on Plasma Science. 39 (11): 2974-2975 (2011). 7. Kim JY, Ballato J, Foy P, Hawkins T, Wei Y, Li J, Kim SO. Apoptosis of lung carcinoma cells induced by a flexible optical fiber-based cold microplasma. Biosens Bioelectron. 2011 Oct 15;28(1):333-338. 8. Kim JY, Wei Y, Li J, Foy P, Hawkins T, Ballato J, Kim SO. Apoptosis of Lung Carcinoma Cells Induced by Flexible Cold Microplasma Jets for Improvement of Targeting. Small, 7: 2290 (2011). 9. Nishijima KA, Wall MM, Chang LC, Wei Y, Wong DKW. First report of association of Mucor circinelloides on Noni (Morinda citrifolia) in Hawaii. Plant Disease, 95: 00, (2011). 10. Kim JY, Wei Y, Li J, Kim SO. 15-μm-sized single-cellular-level and cell-manipulatable microplasma jet in cancer therapies. Biosens Bioelectron. 26: 555-9 (2010). 11. Kotturi, HSR, Li, J, Branham-O’Connor, M., Yu, X., Wagner, TE, Wei, Y. In vitro and in vivo delivery of a novel anticancer fusion protein MULT1E/FasTI via adenoviral vectors. Cancer Gene Therapy, 17: 164-170 (2010). 12. Kim, JY, Kim, SO., Wei, Y., Li, J. A flexible cold microplasma jet using biocompatible dielectric tubes for cancer therapy. Applies Physics Letter, 96: 203701 (2010). 13. Kim, JY, Ballato, J., Foy, P., Hawkins, T., Wei, Y., Li, J., Kim, SO. Single-Cell-Level Cancer Therapy Using a Hollow Optical Fiber-Based Microplasma. Small, 6: 1474-8 (2010). 14. Branham-O’Connor, M., Li, L., Kotturi, HSR, Yu, X., Wagner, TE, Wei, Y. Fusion induced reversal of dendritic cell maturation: an altered expression of inflammatory chemokine and chemokine receptors in dendritomas. Oncology Reports, 23: 545-550 (2010). 15. Zhang, X., Thorne, RE., Wagner, TE, Wei, Y. Regulatory T cells and cancer therapy: an old story with a new hope. Current Cancer Therapy Reviews, 6: 34-40 (2010). 16. Wang, R., Li, B., Wei, Y., Yao, H., Neville, BW, Peng, X., Gao, BZ. “Wavefront Division Complex Fourier-Domain Optical Coherence Tomography,” Optics Letters, in press (2009). 17. Ma, Z., Yun, JX, Wei Y., Burg, KJK, Yuan, X., Gao, BZ. Laser guidance-based cell detection. Proc. SPIE 7400: N1-N11 (2009). 18. Holle, L., Song, W., Holle, E., Wei, Y., Li, J., Wagner, TE, Yu, X. In vitro-and in vivo-targeted tumor lysis by an MMP2 cleavable melittin-LAP fusion protein. International Journal of Oncology, 35: 829-835 (2009). 19. Wei, Y., Li, J., Wagner, TE. Dendritoma Vaccine for cancer. Current Cancer Therapy Reviews, 5: 134-141 (2009). 21. Lolle, L., Song, W., Holle, E., Nilsson, J., Wei, Y., Li, J., Wagner, TE, Yu, X. In vivo targeted killing of prostate tumor cells by a synthetic amoebapore helix 3 peptide modified with two γ-linked glutamate residues at the COOH terminus. Molecular Medicine Reports, 2:399-403 (2009). 22. Zhang, X., Li, J., Wong, D., Wagner, TE, Wei Y. Fermented Noni Exudates (fNE)-treated dendritic cells directly stimulate B lymphocyte proliferation and differentiation. Oncology Reports, 21:1147-1152 (2009). 23. Li, J., King, AV., Stickel, SL., Burgin, KE., Zhang, Z., Thomas E. Wagner, TE., Wei, Y. Whole Tumor Cell Vaccine with Irradiated S180 Cells as Adjuvant. Vaccine, 27:558-564 (2009). 24. Craig, DH, Gayer, CP., Schaubert, KL, Wei, Y., Li, J., Basson, MD. Increased extracellular pressure enhances cancer cell integrin binding affinity through phosphorylation of β1-integrin at threonine 788/789. Am J Physiol Cell Physiol 296: C193-204 (2009). 25. Ma, Z., Burg, KJL, Wei, Y., Yuan, XL, Peng, X., Gao, BZ. Laser-Guidance Detection of Cells with Single-Gene Modification. Applied Physics Letter, 92: 2139021-2139023 (2008).